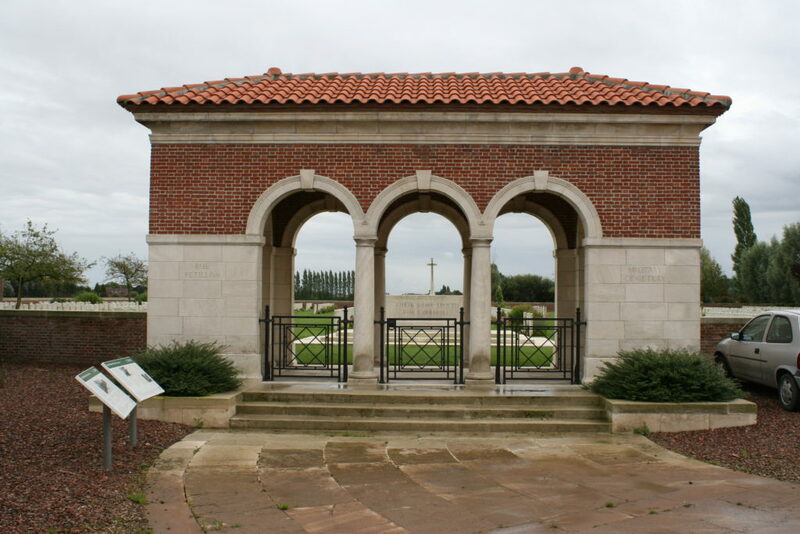 Grey skies and an ornate cemetery entrance greet us as we arrive at Rue-Petillon Military Cemetery. 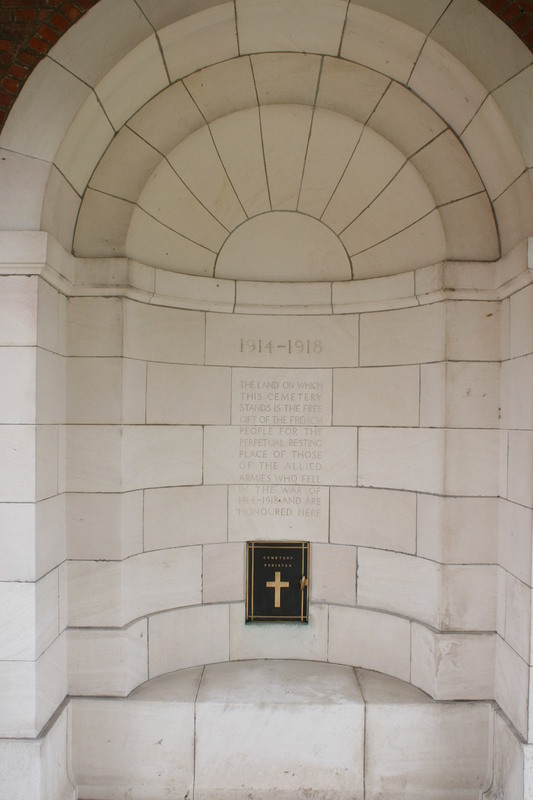 …and through the entrance, the Stone of Remembrance directly in front of us. 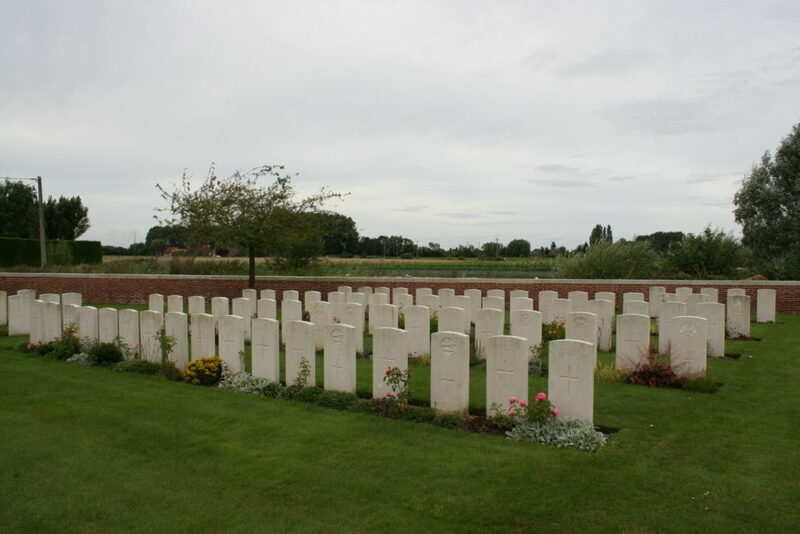 This view looks west back towards the Stone of Remembrance, cemetery entrance, and three special memorial headstones along the wall on either side; we shall visit the two on the left later. And, turning round, this view looks east from the same position. 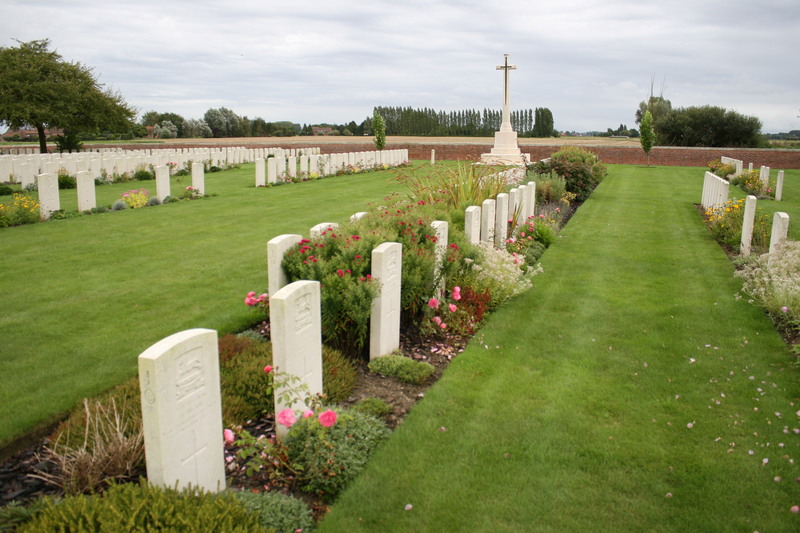 The first burials here were made in late 1914 and the cemetery was used until the spring of 1918. 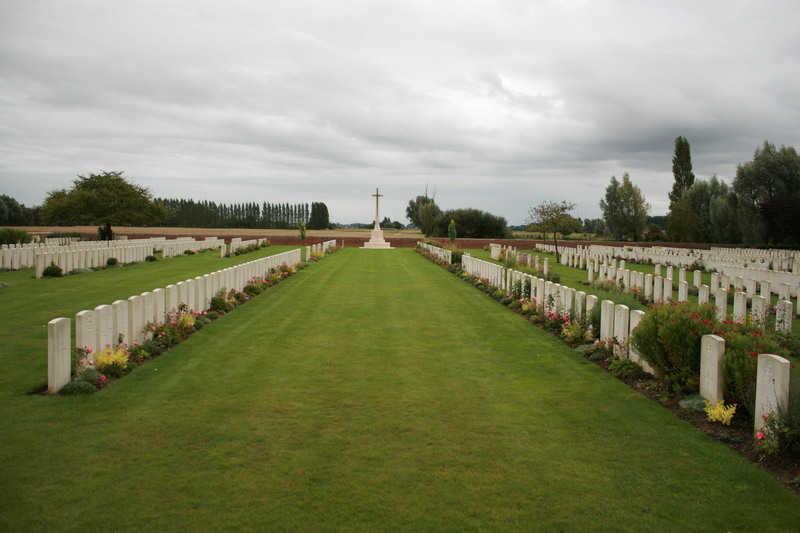 This is quite a large cemetery, more than 1,500 men now buried or commemorated here. 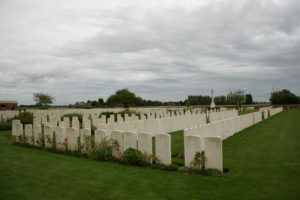 Despite the number of burials, the cemetery is divided into only four plots, nearly all the northern half of the cemetery making up Plot II (above). 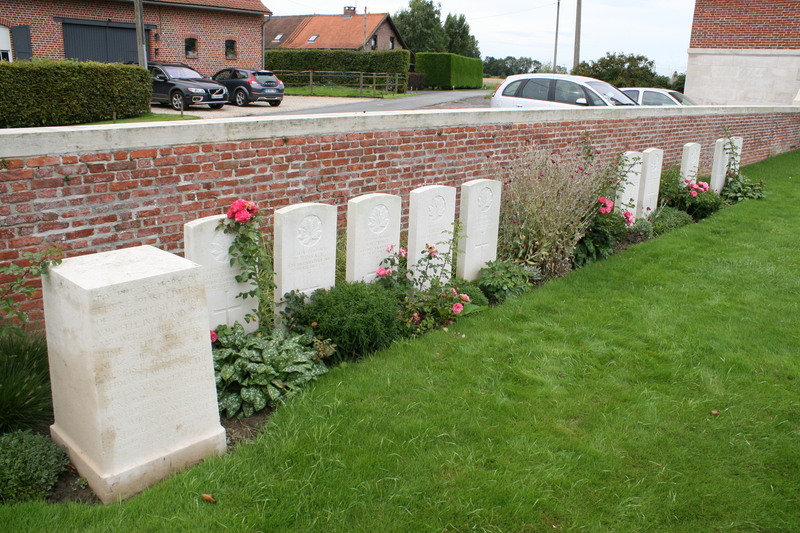 These two rows of headstones, just inside the entrance, are in Plot IV, with Row B in the foreground (and to the right in the photo below), and the two headstones centre right comprising Row C.
…the rest of this half of the cemetery is all designated as Plot II. If you take a look at the cemetery plan at this point, you can see that we are walking west down Plot II along the gap separating Row A (not in shot) and Row C (in the foreground, above & below). When this sector of the front was recaptured in the autumn of 1918, the cemetery was opened once again, and by the time of the war’s end it was being used by no less than twelve British battalions. 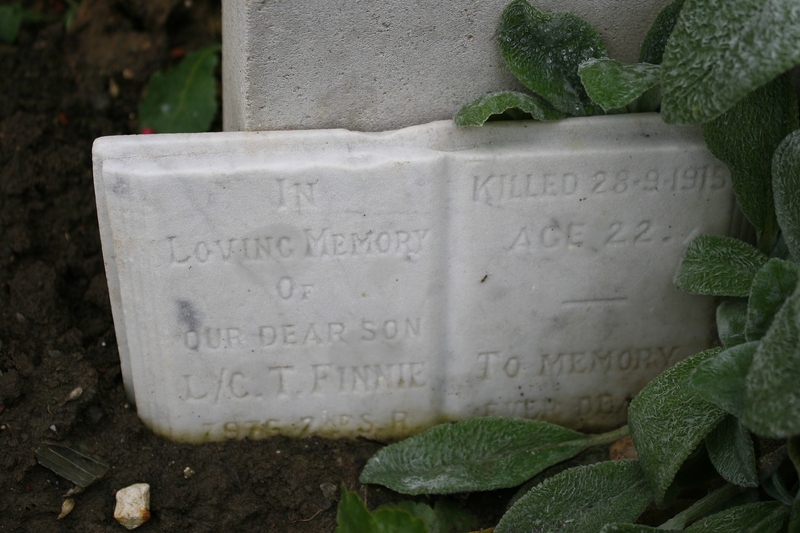 …the original family grave marker still remains. ‘In Loving Memory of Our Dear Son’. Eight German graves at the eastern end of Row K.
View from the eastern corner of the cemetery, Row M on the far right along the wall. 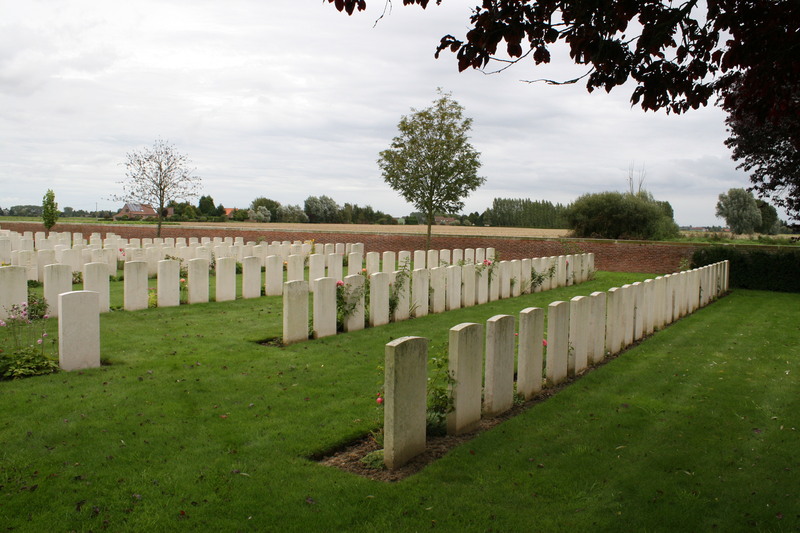 …and now at the far eastern end of Plot II, Row B in the foreground. 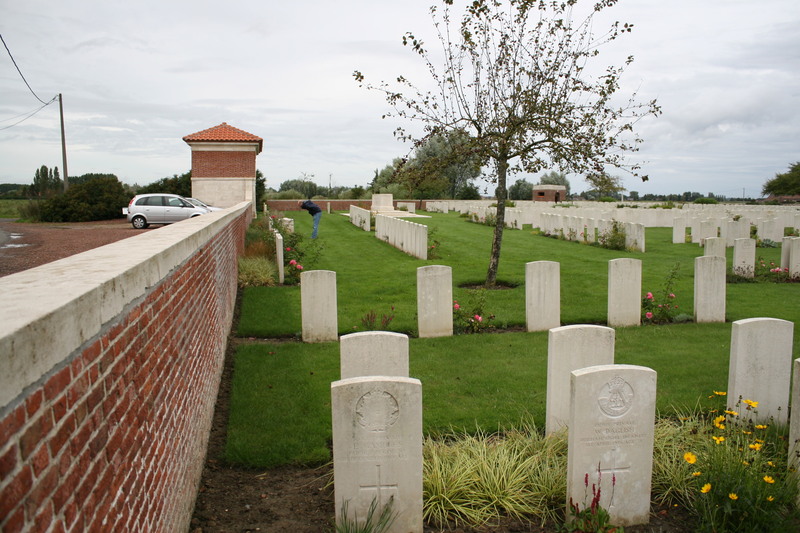 By far the majority of the burials in this photograph are unidentified. Many of the men buried in Rue-Petillon died of their wounds at a dressing station located in nearby buildings, and, as with many of the cemeteries in this sector, more graves were added after the war as the battlefields around Fleurbaix were cleared, and smaller cemeteries were integrated into the larger ones. 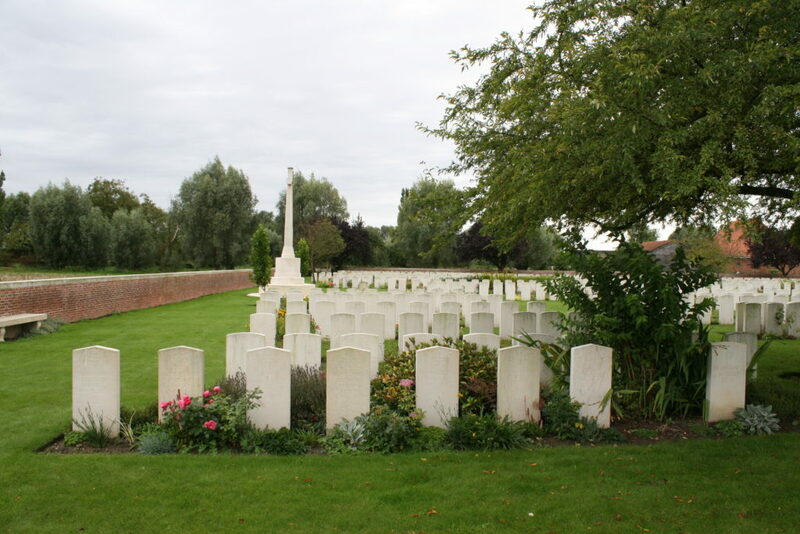 …and further left. 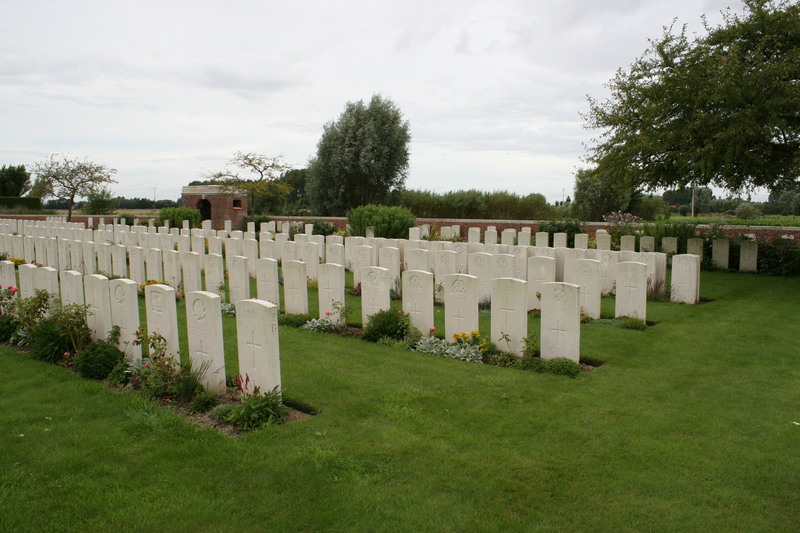 Plot II Row A is on the far left with Plot IV, the headstones at a ninety degree angle to all the other rows, in the distance. 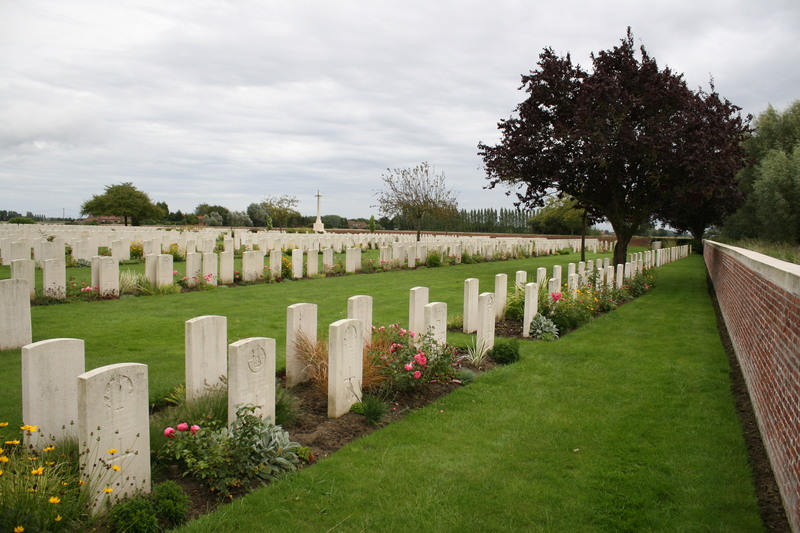 And this view looks down the other side of Row A to the previous photo, towards the Stone of Remembrance and the cemetery entrance in the background. Looking west down Plot I, Row E on the right. Unidentified burials in Plot I Row P.
Three of these two pairs of headstones in Plot I Row G (above & below) have been replaced in recent years, the old ones having become near-illegible or been damaged in some way. How do I know? 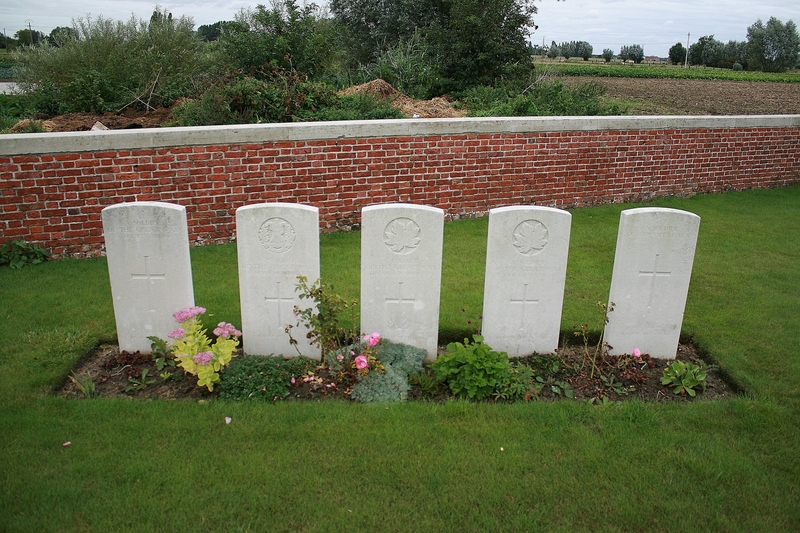 Well, in recent years headstones made of Italian Botticino marble have become more noticeable in CWGC cemeteries, and armed with that fact, it’s not too difficult to spot which of these four headstones is the one made of Portland Stone, like the majority of British headstones across the Western Front. It’s also easy to see which have been lazer-etched (on the left), as opposed to hand carved (on the right). …and panning even further left, Row B (and Baldrick) now visible on the left along the boundary wall. 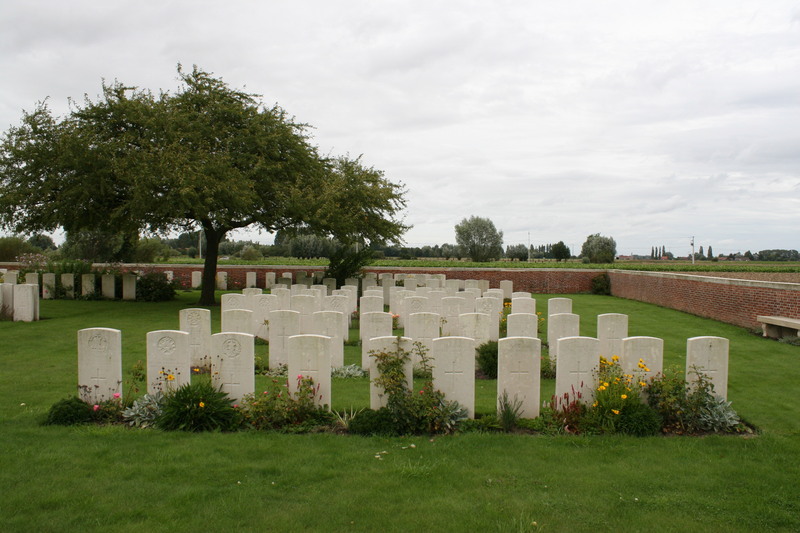 These touching headstones in Plot I Row E (the reverse sides of these headstones are visible in the previous picture in front of the tree), five men of the King’s (Liverpool Regiment) and a single man of the Royal Lancaster Regiment, were all killed in early October 1918. 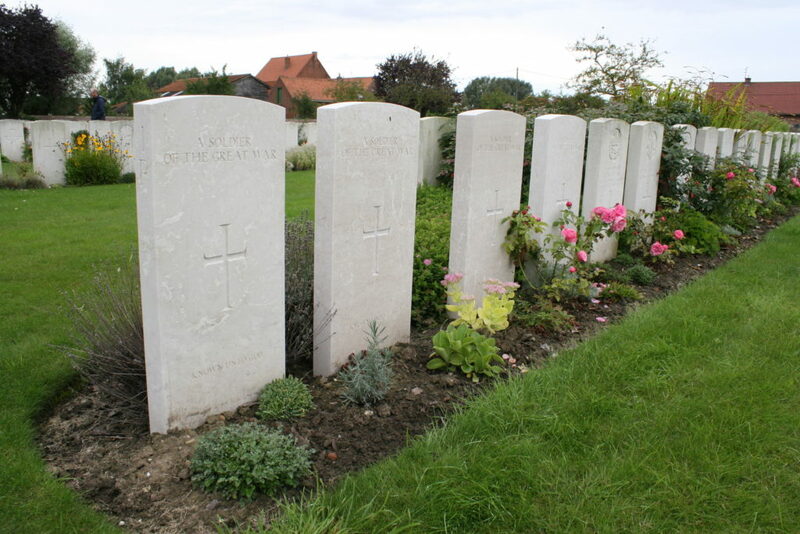 The four Oxford & Bucks Light Infantrymen on the left of this group in Plot I Row K were among the 61st (South Midland) Division casualties on 19th July. 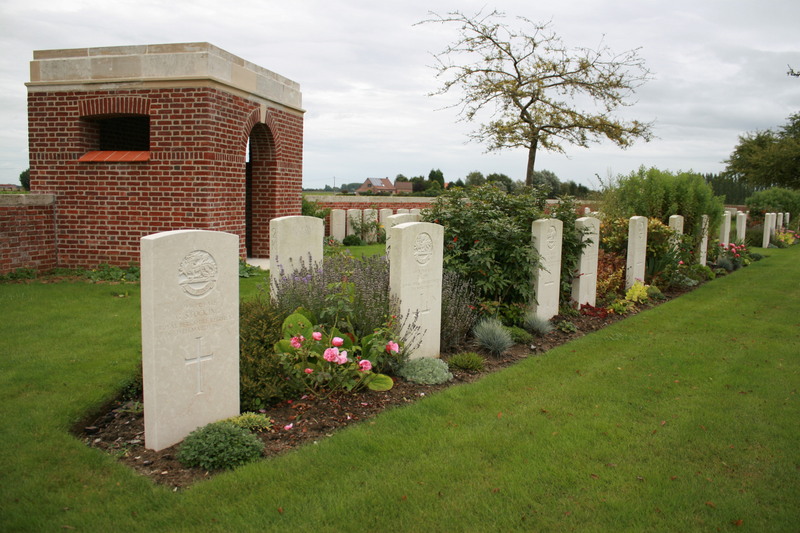 Of the three Australian burials, the two infantrymen who died on 15th July are among over 30 Australians killed that day and buried in Row K (see below), victims of a German bombardment and subsequent raid on the Australian lines that caused nearly 100 casualties in total. 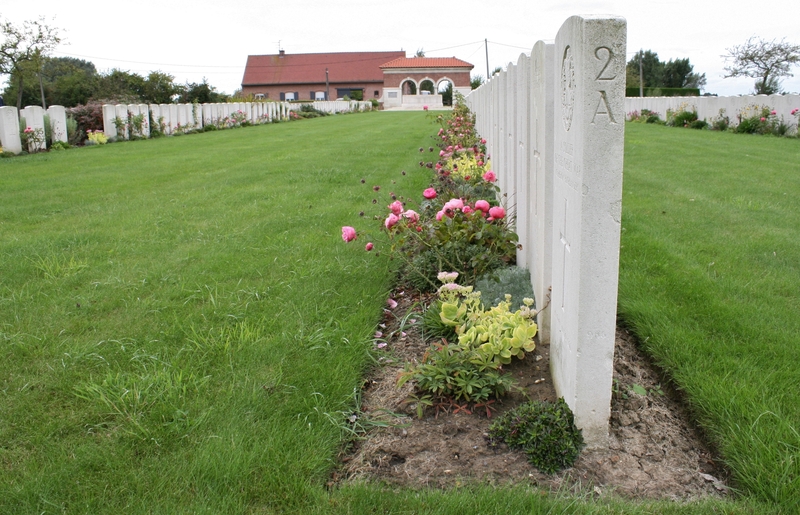 The Germans suffered about 30 casualties, but did manage to take three prisoners. 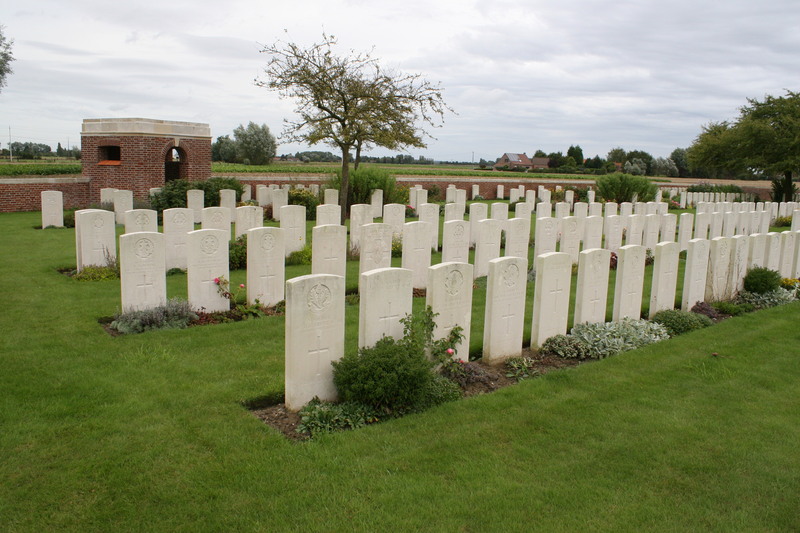 Row K. In total there are more than 250 Australians buried in this cemetery, all but three in Plot I. A single New Zealand burial in Plot I Row L, one of 24 in the cemetery, alongside more Australians, those at this end of the row killed in August 1916. The Australians started using the cemetery in early May 1916 and they continued to use it until they left this sector at the end of September. 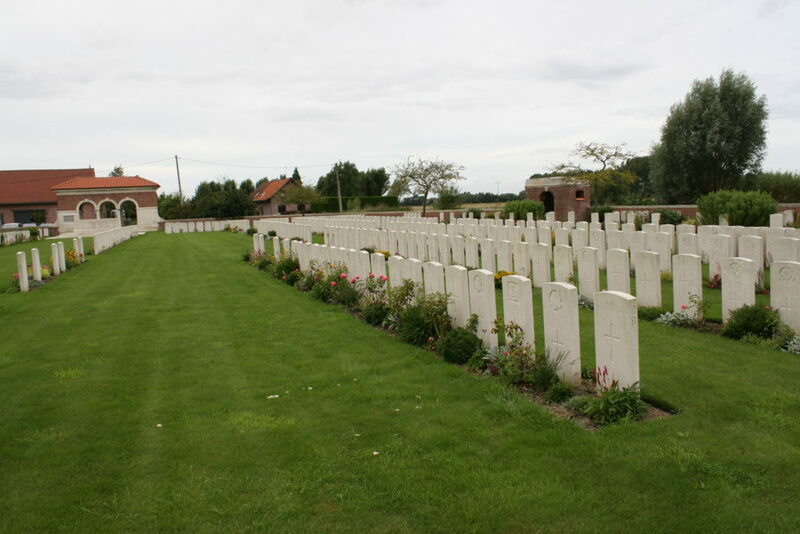 Forty nine identified Australians who died on 19th, and 62 who died on 20th July 1916, all at Fromelles, are buried in Rue-Petillon. 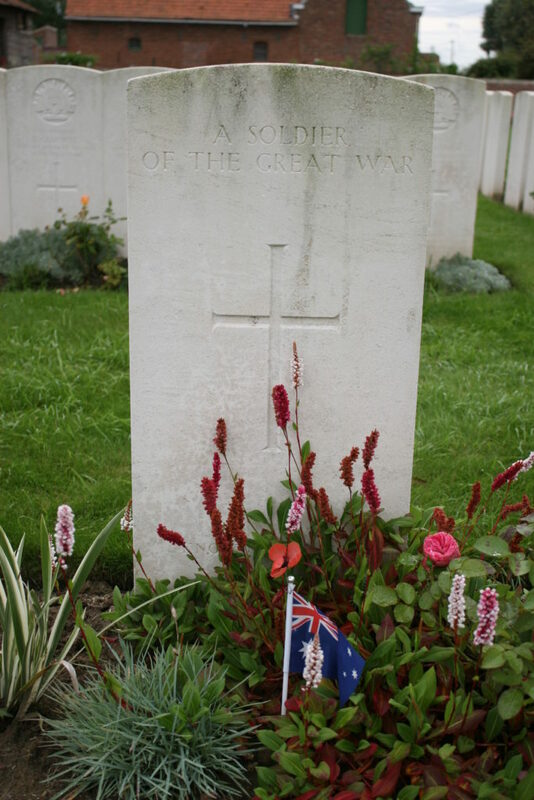 The little message left on this headstone in Row K of Private Thomas Langford Watts, killed on 2oth July aged just 19, had me confused for a while, but I think I understand now – note the service numbers on the headstone and the message – but still I cannot find the name Sydney Bryden Wells anywhere on the CWGC database. 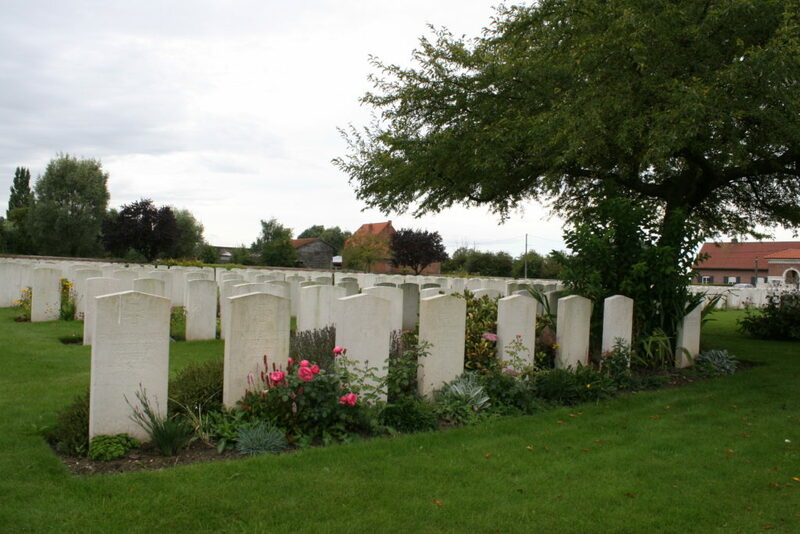 Private Edward George Austin, killed on 20th July aged 27. ‘Mother’s Love’. Pity poor Ellen Caroline. 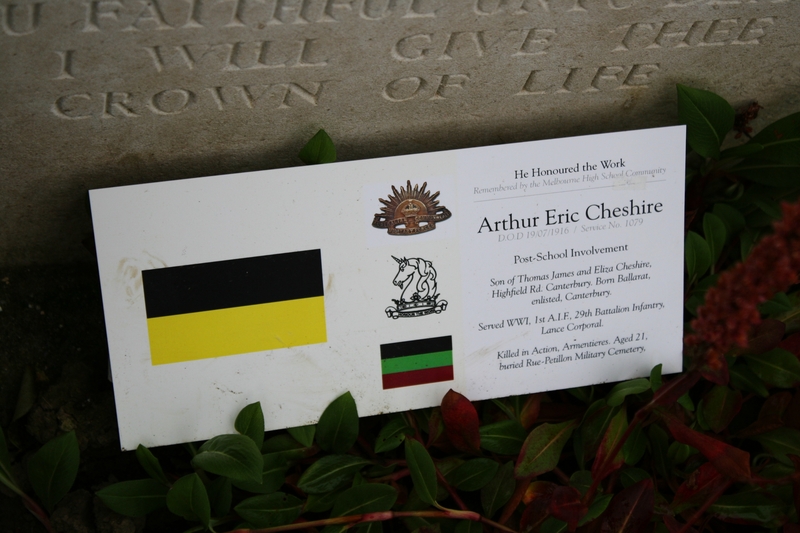 Lance Corporal Arthur Eric Cheshire. 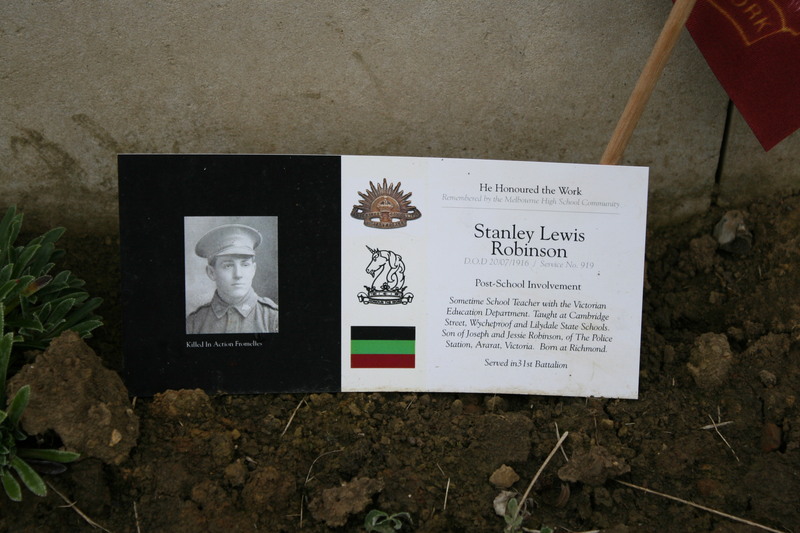 Remembered by the Melbourne High School Community. 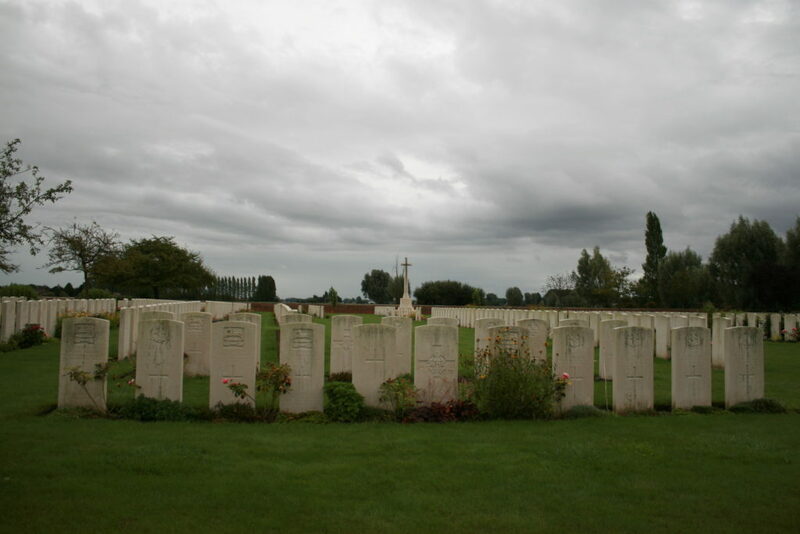 In the centre of the cemetery looking east towards the Cross of Sacrifice, West Yorkshire Regiment (Prince of Wales’s Own) burials from the summer of 1915 in Plot I Row O in front of us, Plot II across the grass avenue to the left. At the western end of Plot I Row L, (part of Plot III Row A visible on the far right), still more Australians killed at Fromelles. 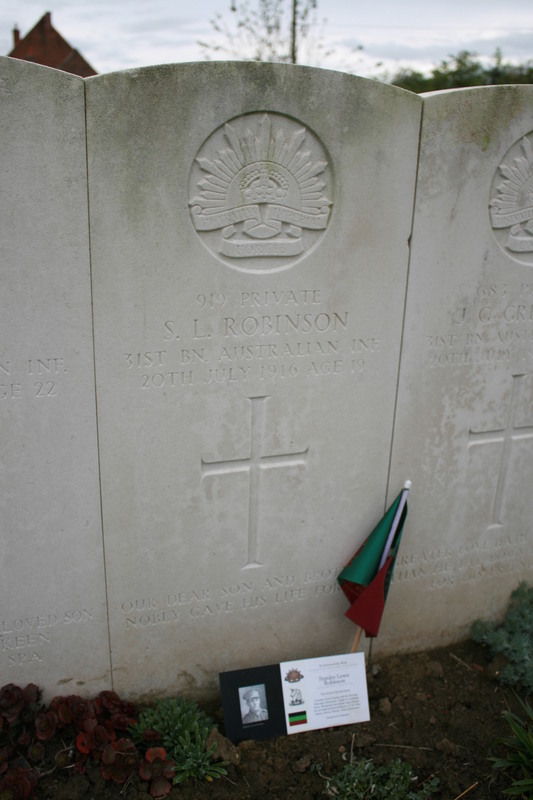 ..also from Melbourne. Well, Victoria, anyway. 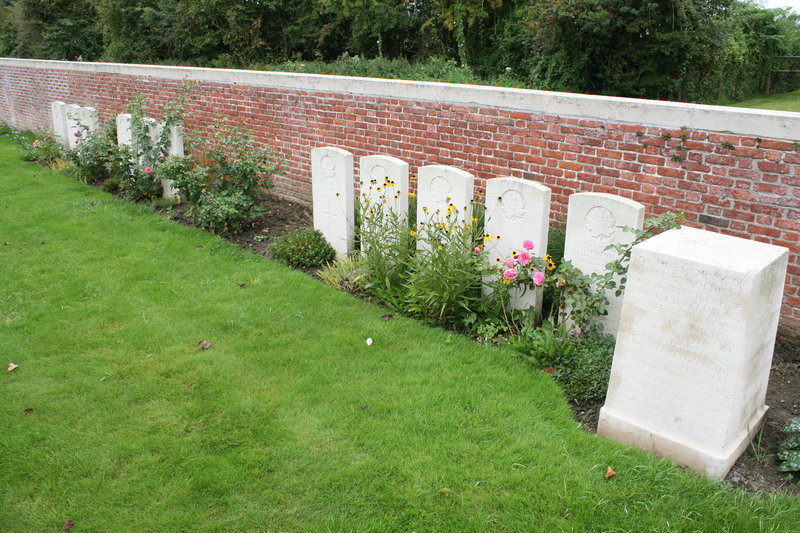 …and these are Row A headstones 15-26. 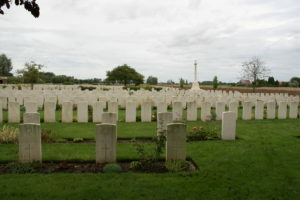 Part of Plot III Row B (Row A behind). …and looking north east towards the cemetery entrance from the same position. 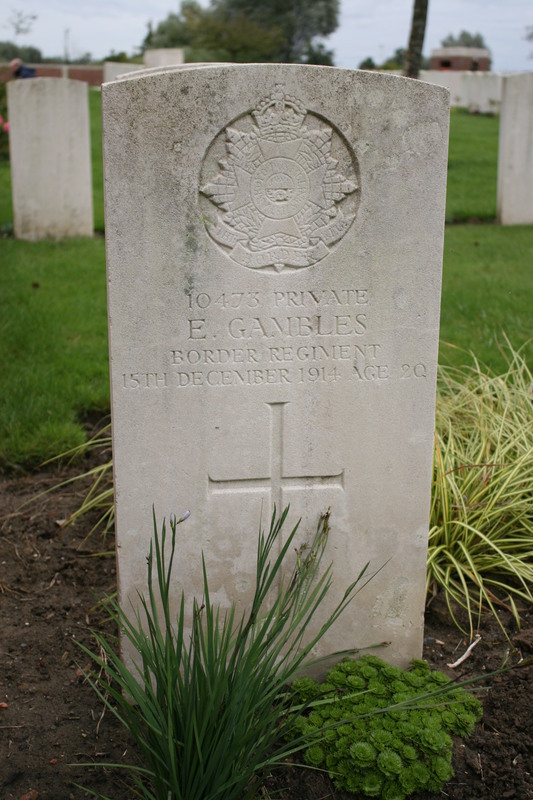 Private E. Gambles (Plot I A1), who died of wounds aged 20 on 15th December 1914, one of 35 identified burials from 1914 in this cemetery. …so we’d better join Baldrick to take a look. 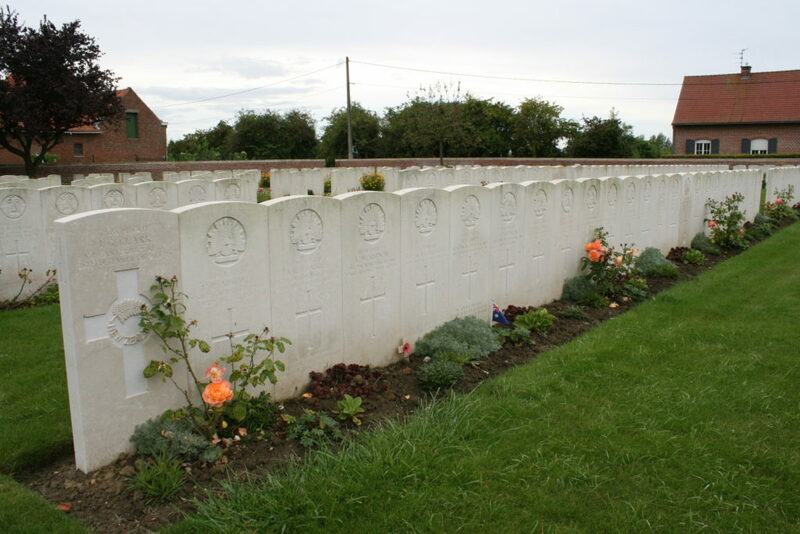 A Duhallow Block remembers 21 soldiers originally buried in four cemeteries ‘whose graves were destroyed in later battles’. …remember each man by name. 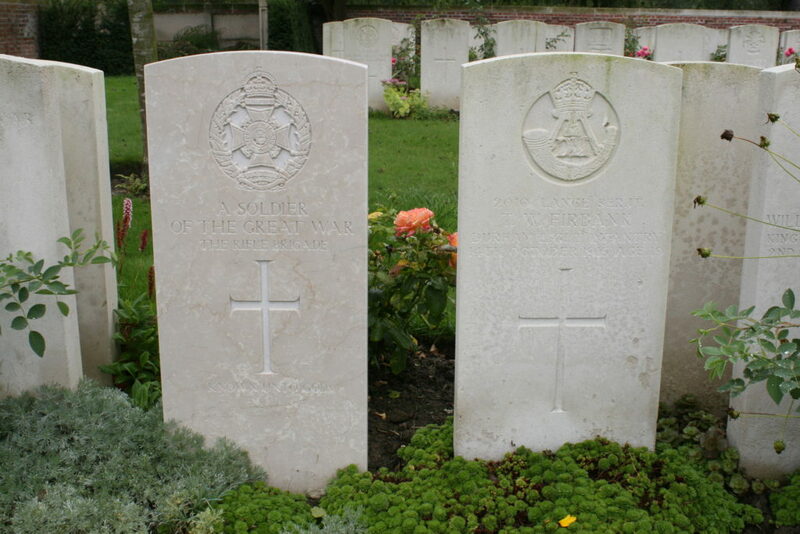 A long time ago I told you we’d visit these two headstones just inside the cemetery entrance. 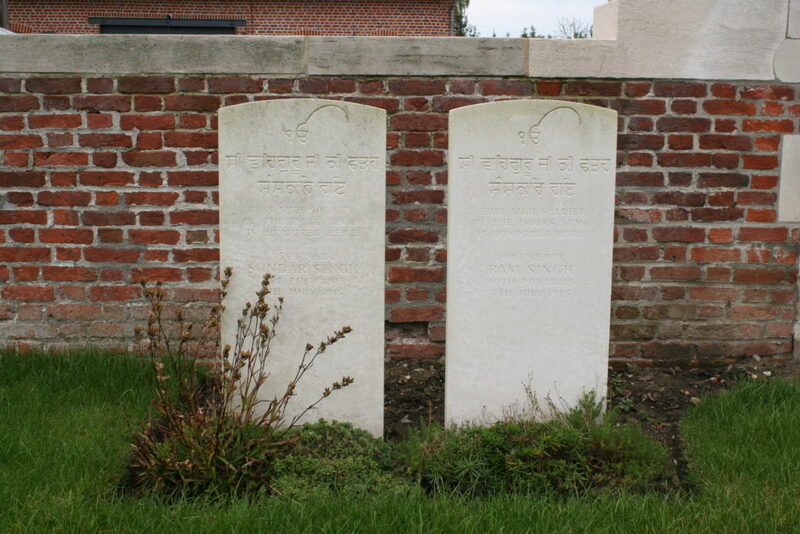 These two Sikh soldiers both died in July 1915, and are ‘Honoured Here’, as in Sikhism, of course, cremation is the usual method for disposal of bodily remains. Close to the Stone of Remembrance, this is the grave of Major William Ainsworth, Second-in-Command of the 5th Bn. 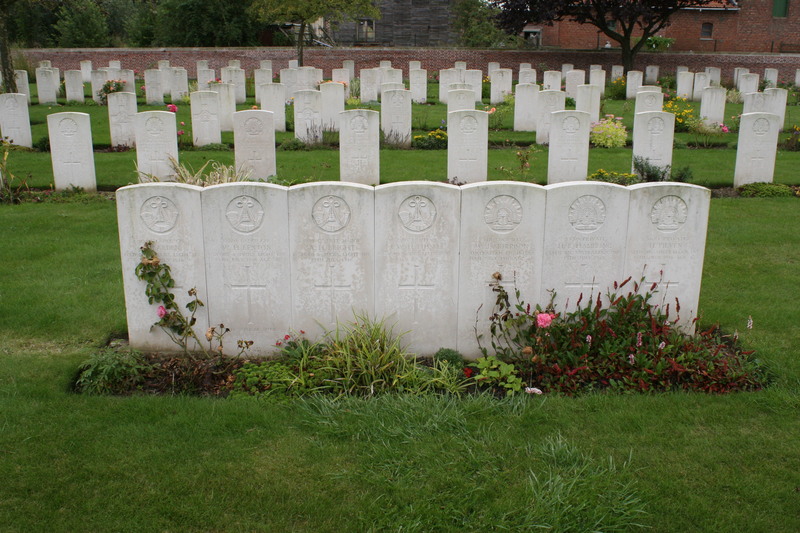 The Loyal North Lancashire Regiment, killed in action on 16th April 1917 aged 39, and buried in Plot I N 53. 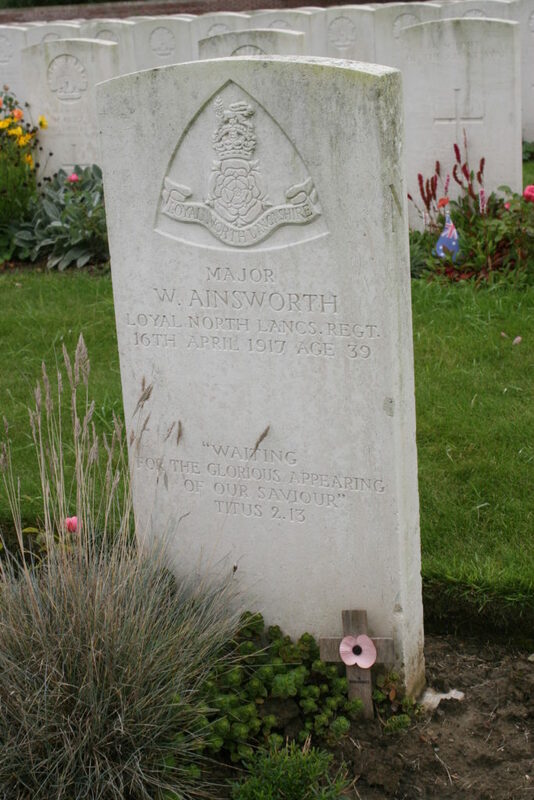 Ainsworth was the only casualty suffered by the battalion that day, possibly the victim of a German sniper. 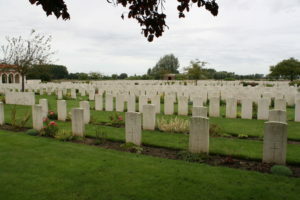 Final view looking down the length of the cemetery. 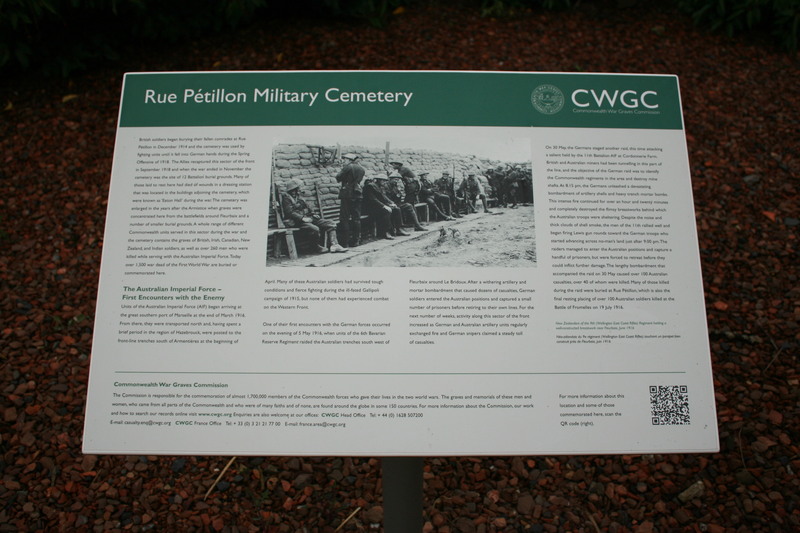 As we leave, you may have spotted the CWGC boards just outside the cemetery entrance at the very start of the post. Here’s a close-up should you wish to have a proper look; there’s much more detail here about the German raid of 30th May. 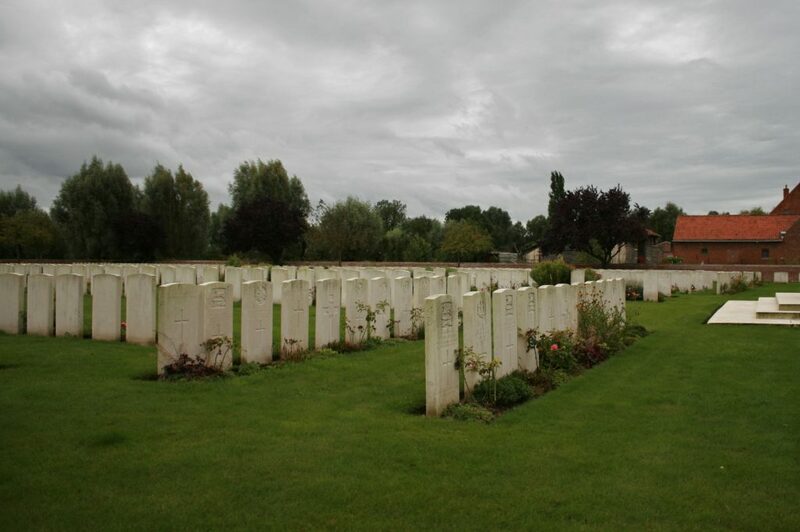 Next stop: Rue-du-Bois Military Cemetery. 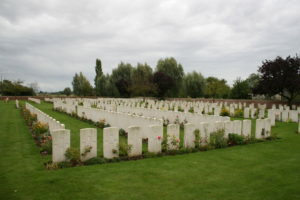 My eye caught the name Sydney Bryden Wells and your comment not locating his name on the CWGC. My curiosity got the better of me and I think I have an answer. “Another good post”, even without the thank you is good enough for me! I thought the name might catch your eye. 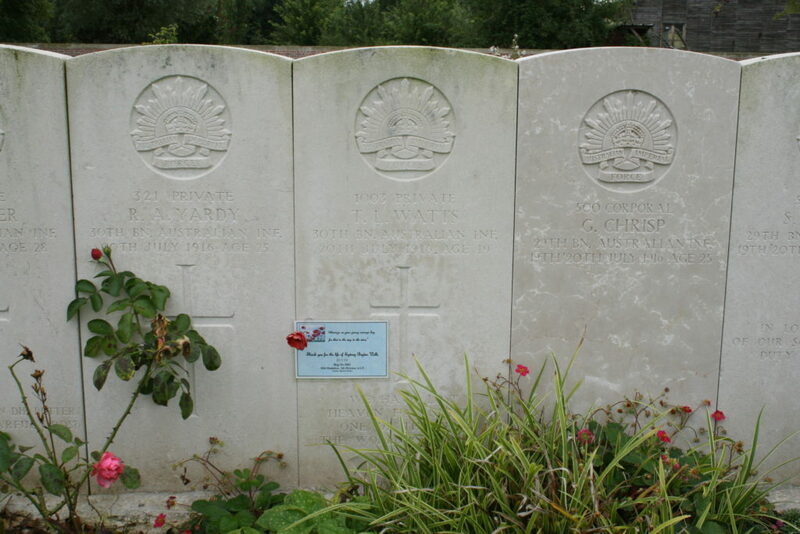 The note says ‘Thank you for the life of Sydney Bryden Wells – 20.7.16 – Reg No 1002 – 30thBn 5th Division AIF’. 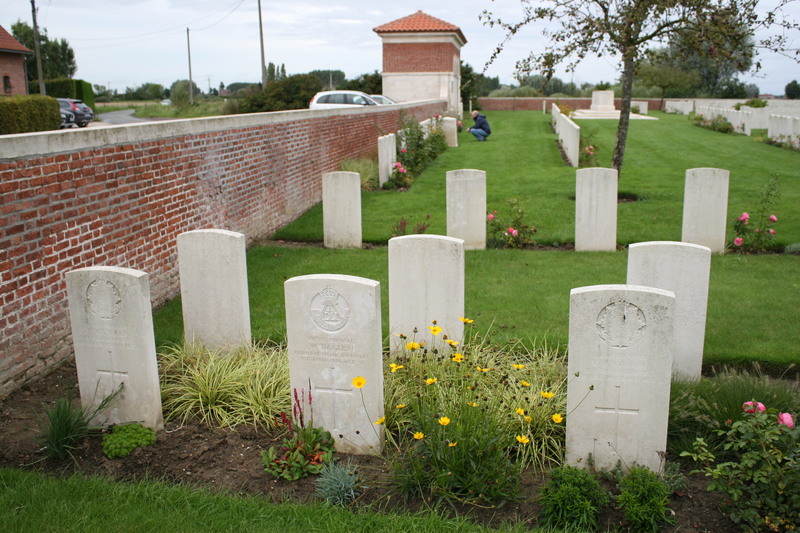 My Grt Grt Uncle George Edward Pritty is here – he’s in IV B2 and is actually in your pic of Plot III Row B – headstone 2nd from the left. 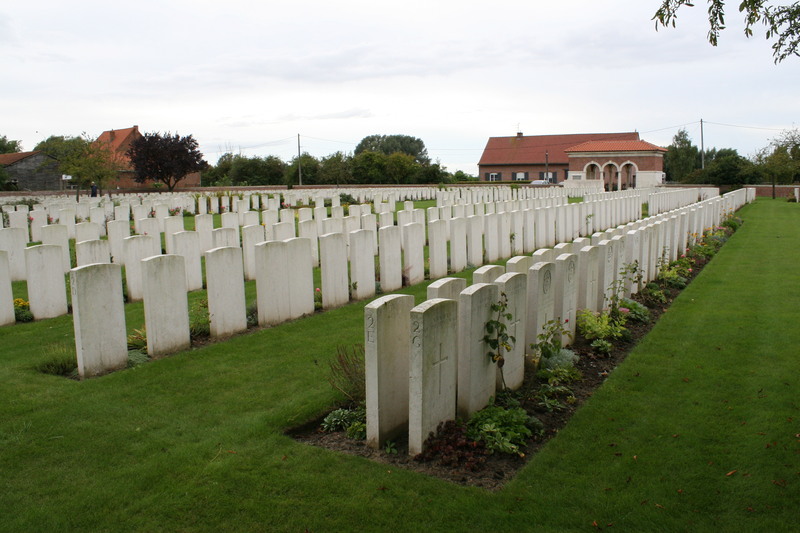 Despite having had an interest in The Great War for many many years I didn’t know about George until early 2015 when, ahead of my second trip in July that year to The Somme I’d decided to do some more in depth research on whether I’d got family members who had been lost in WW1. After a few false leads (I found Ancestry.co.uk a great tool) I discovered George and managed to find out more about his life. 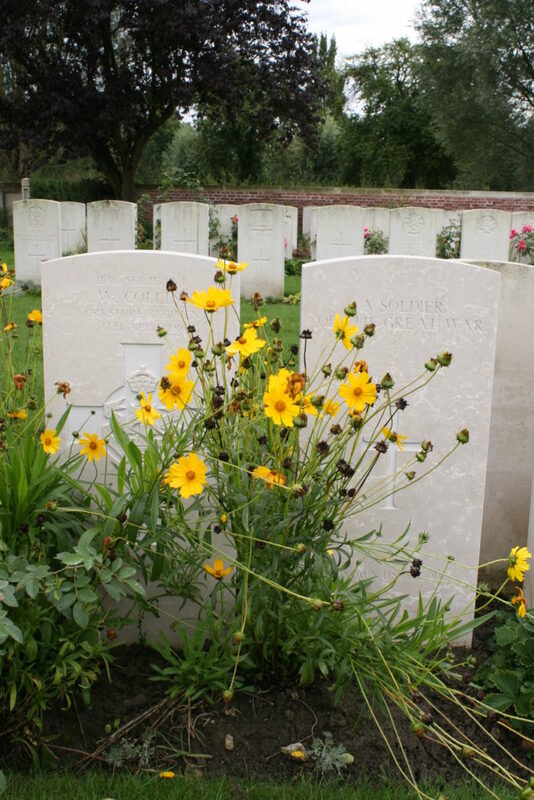 He was born around 1892/3 in Camden Town, by the age of 6 both of his parents had died and him and his next two elder brothers were put into the workhouse. 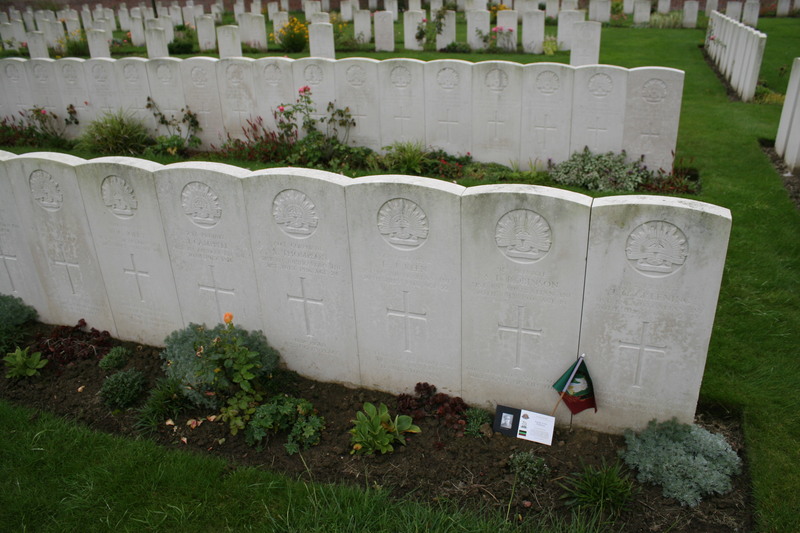 He joined the 2nd Bn Middlesex Regiment in Feb 1910 at the age of 17. 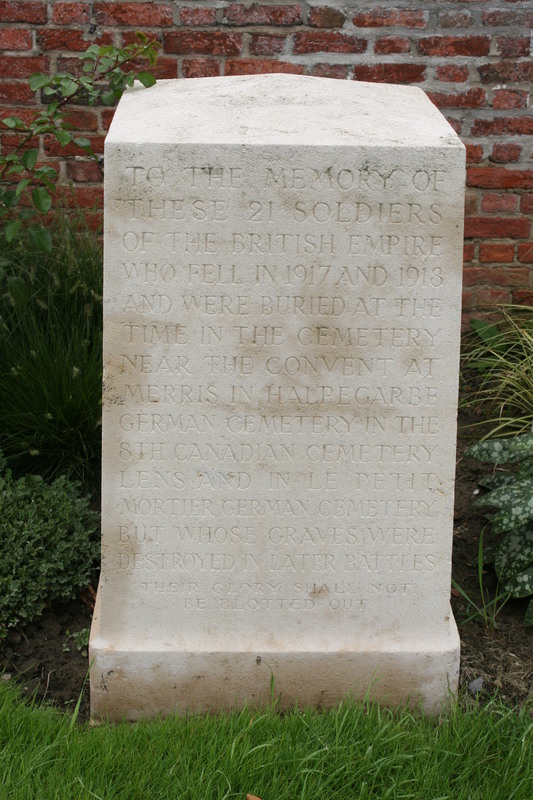 After being stationed overseas in Malta his Battalion was recalled to England to form up for despatch to France as part of the 8th Division. 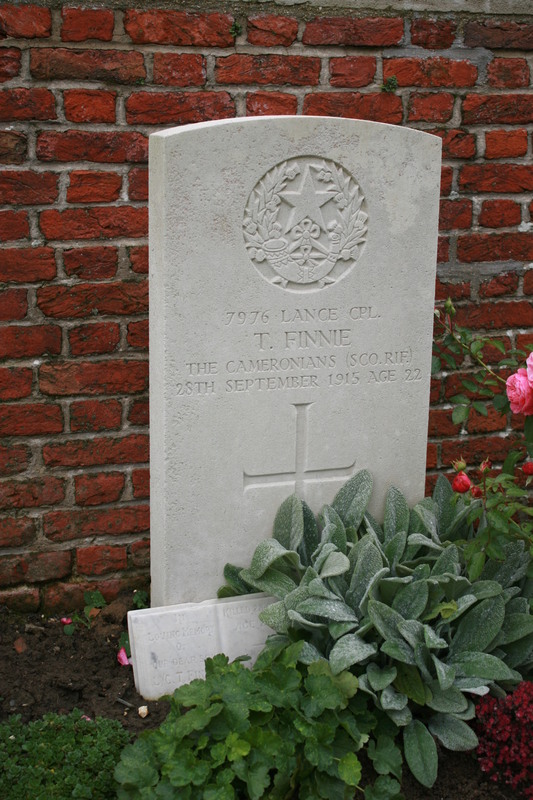 He was promoted to Lance Corporal in October 1914, and sailed for France in November 1914. 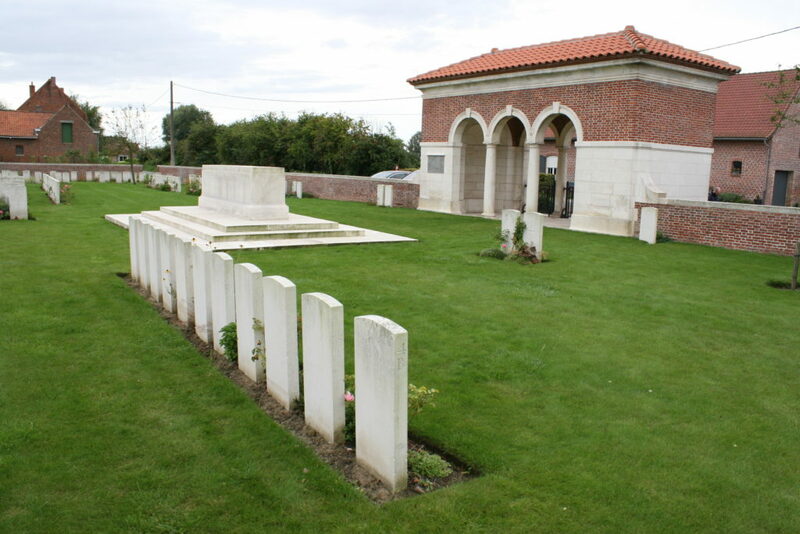 He was killed 4th January 1915 just north of Neuve Chappelle near the Moated Grange. 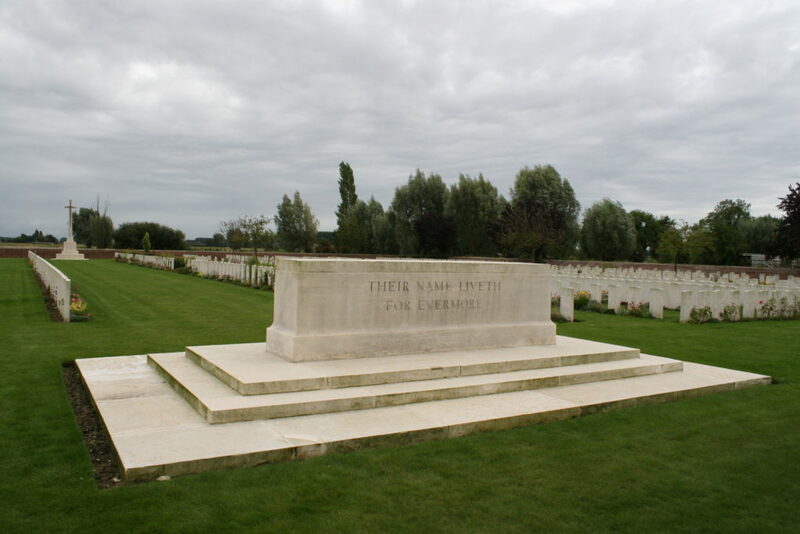 Originally buried at Cuthbert Farm Cemetery (which I believe was at the nearest First Aid post to his trench) he was later re-interred at Rue-de-Petillon. I visited his grave in July last year, and with the help of copies of the Battalion War Diary I walked the area where I believe he was killed. It was very sobering, but also I felt a great sense of well being that just over one hundred years later I had tracked him down and made the effort to pay my respects and show that he was not forgotten. 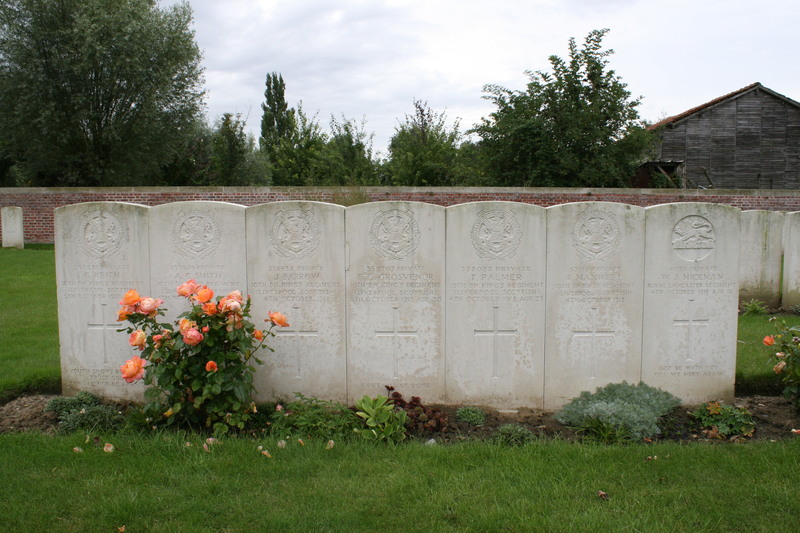 Ironically, George was the youngest of 5 brothers and was killed near the beginning of the war, his eldest brother died in Italy in October 1918, a few weeks short of the Armistice. 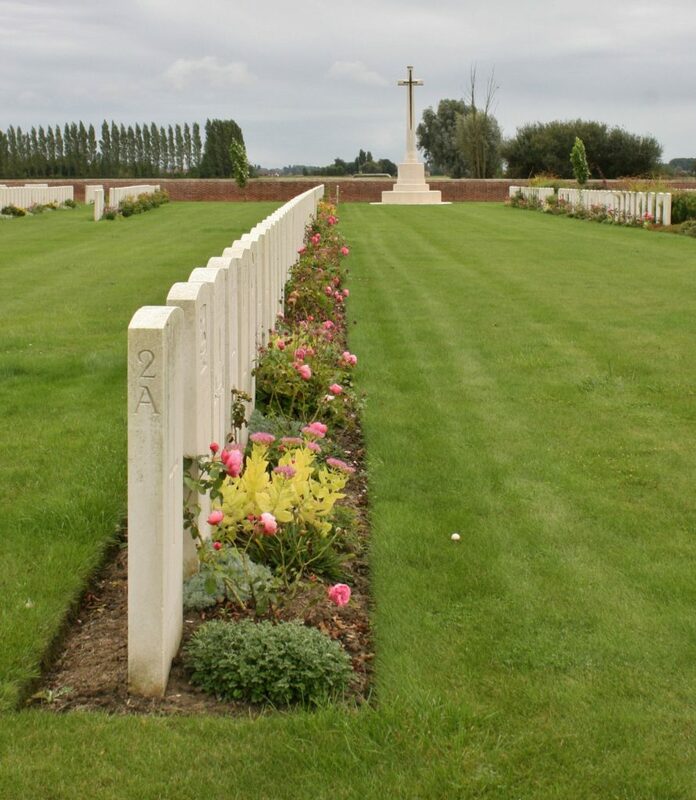 It’s a lovely peaceful spot, thank you very much for sharing your pictures and comments. 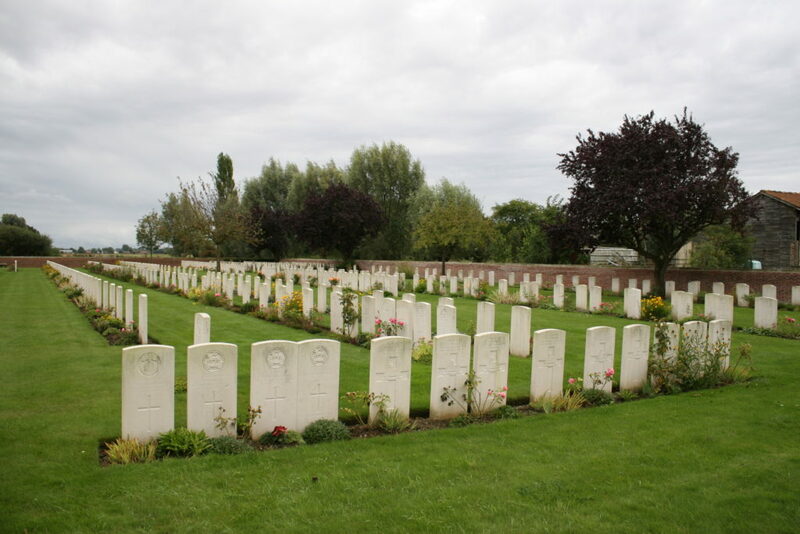 I for one greatly appreciate your efforts to remember the fallen. 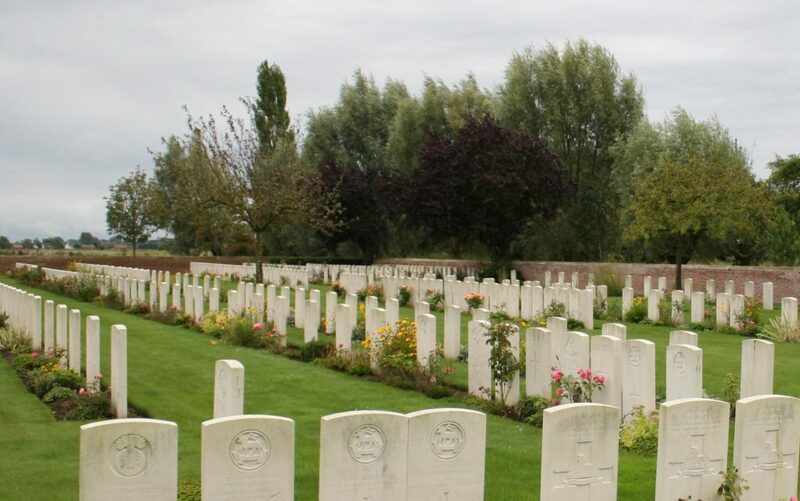 Tony, thank you very much for taking the time to tell us about Lance Corporal Pritty, and for your kind comments at the end. It makes it all worthwhile! Glad you enjoyed this post. Hello, concerning Sydney Bryden Wells and the message on the grave of Private Thomas Langford Watts, this message was put by the descendants of S W Wells in July 2016, for the centenary of the Battle of Fromelles. Pivate Watts returned on the No Man’s Land in the sector of Cordonnerie Farm/Delangre Farm, to rescue his mates, he saved Sydney’s life. 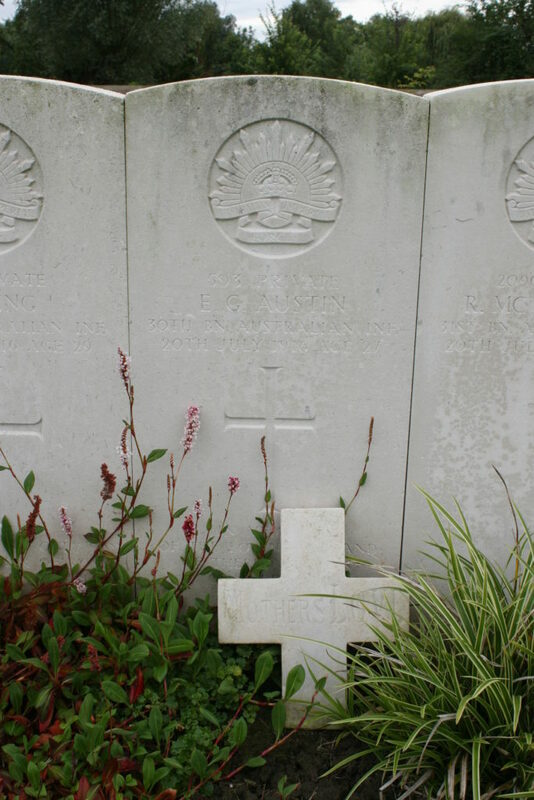 They were almost safe near the aid post when a bullet struck Watts in the head, killing him instantly, After war Wells became a barber in Wollongong. 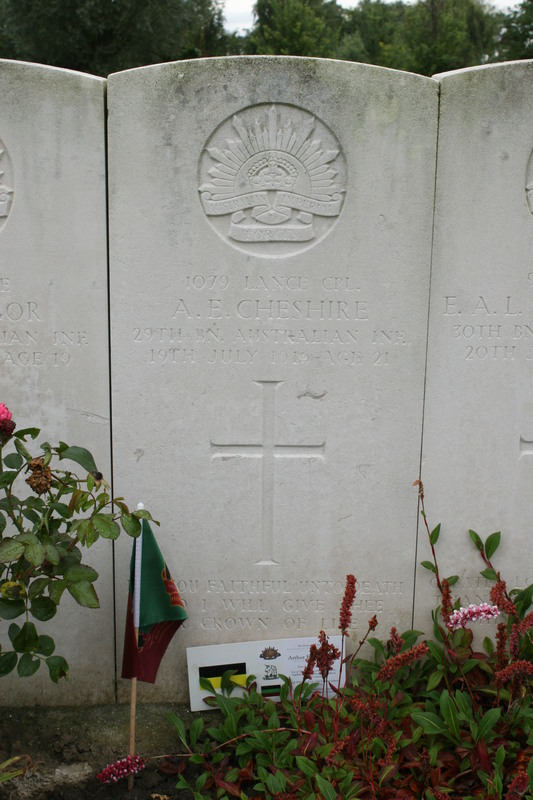 Last July descendants of both soldiers had a meeting at Fromelles. Hello Pierre. 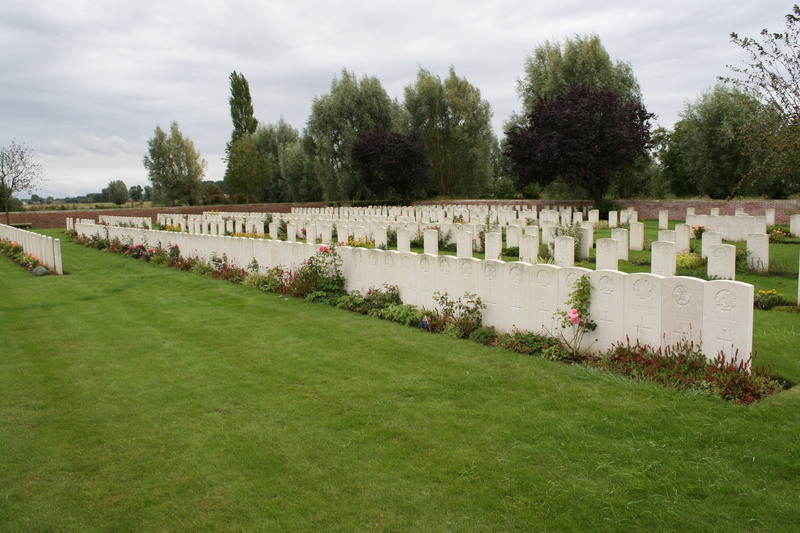 Thank you very much for taking the time to explain the link between Privates Watts & Wells. I presume, as their Service Numbers are 1002 & 1003, that they joined up together? 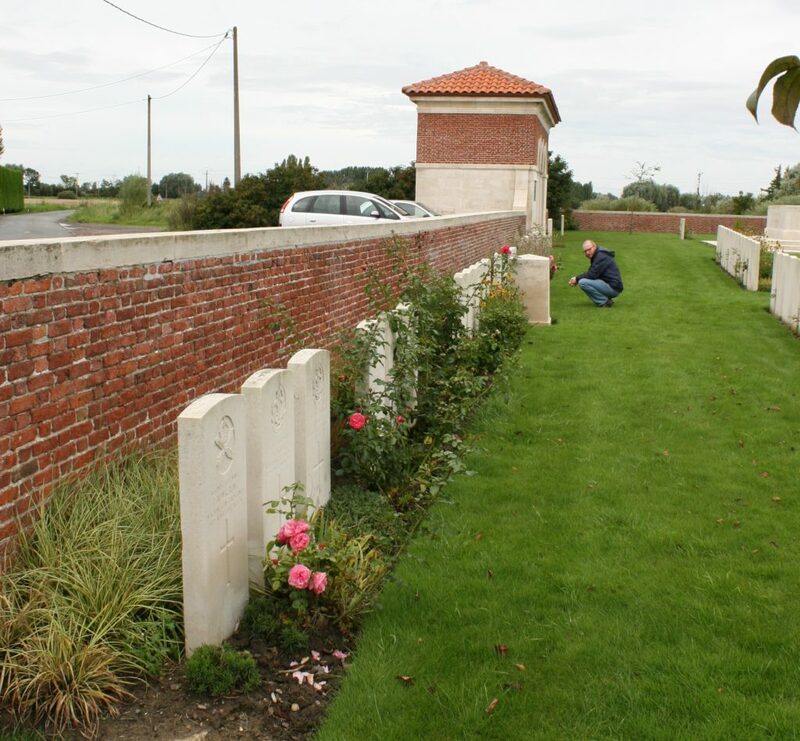 By the way, these photos were taken in August 2014, so I also presume the family of Private Wells must have put the message up in July 2014. 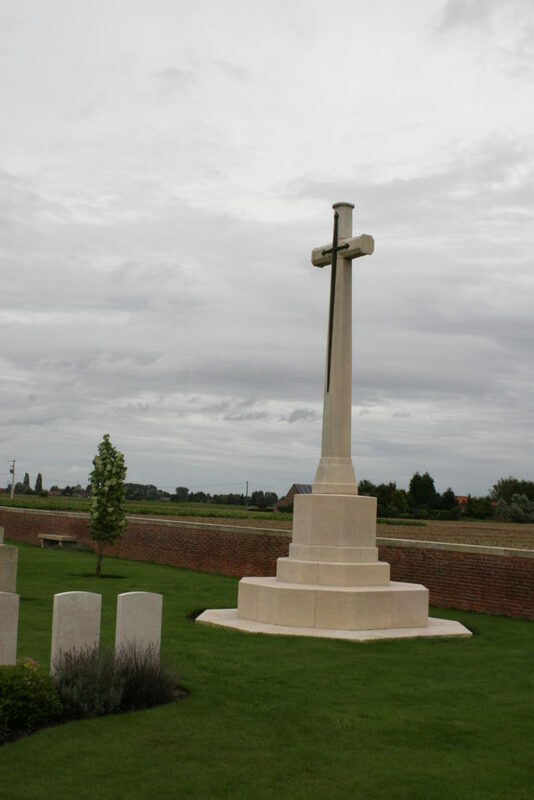 I do hope you get the opportunity to read the other Fromelles posts on this site – eight have so far been published, with the final part, where we visit Anzac Cemetery, still to come – particularly as you might be able to help me with regard to the number problem I mention in the Pheasant Wood post (I’m only being cheeky!). 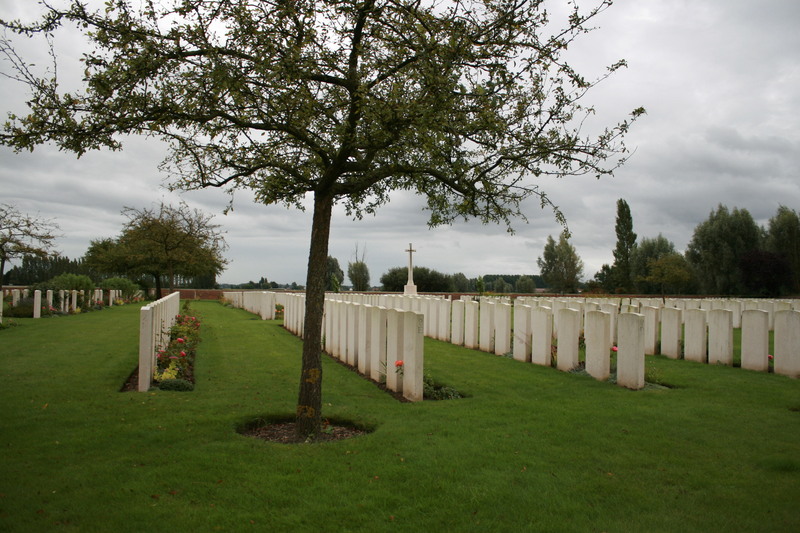 You’ll find the Fromelles section in the categories to the right of each page. Thank you so much again for commenting. 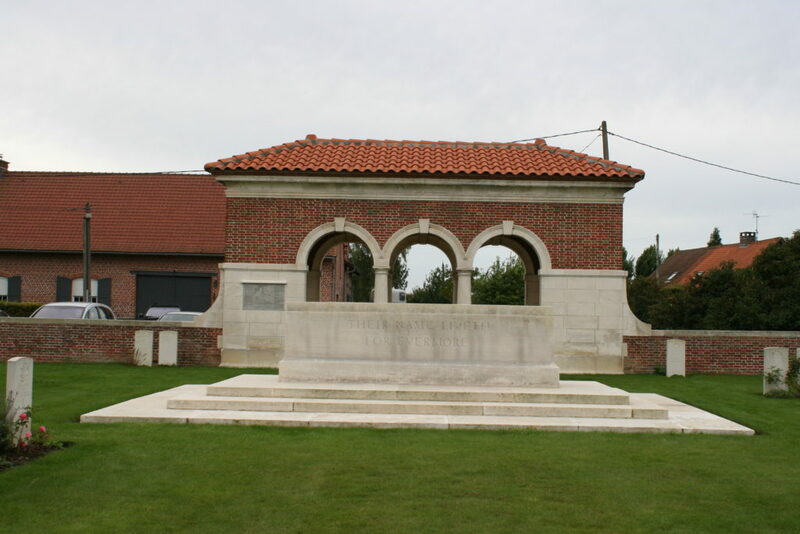 I posted a comment on the post about Pheasant Wood, trying to give you some answers to your question… GWGC done many mistakes on their website, maybe it’s due to the fact that new identifications were done every years since 2009 (exept in 2015) They seem to have some problems with numbers and mathematics… But the list of names is correct even with the six new identified soldiers.